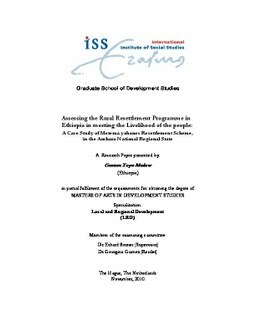 A good number of literatures on resettlement depicts that state sponsored resettlement in Ethiopia has been implemented since the imperial regime. It is also confirmed that the rationale behind the initiative of the topic issue is more or less similar. Put it the other way; recurrent famine, drought, food insecurity and population pressure are some of the factors that drives the programme to be put in place. In connection to this, this study attempts to look at the effect of resettlement in the livelihoods of the resettlers who are moved to metema woreda in 2003, with special reference to village six, seven and eight resettlement site. In this regard, the livelihood framework has been taken as a lens in the analysis of the study. The result of the study reveals that quite a number of resettlers who are relocated to the area are changing their livelihoods positively despite the fact that there are also groups who are not in a position to do so. Hence, in the light of the findings it has been attempted to forward some possible solutions that could have a role in strengthening the livelihoods of the resettlers both now and in the future.